How to Overcome the Fear, Stress, and Pain of Downsizing. 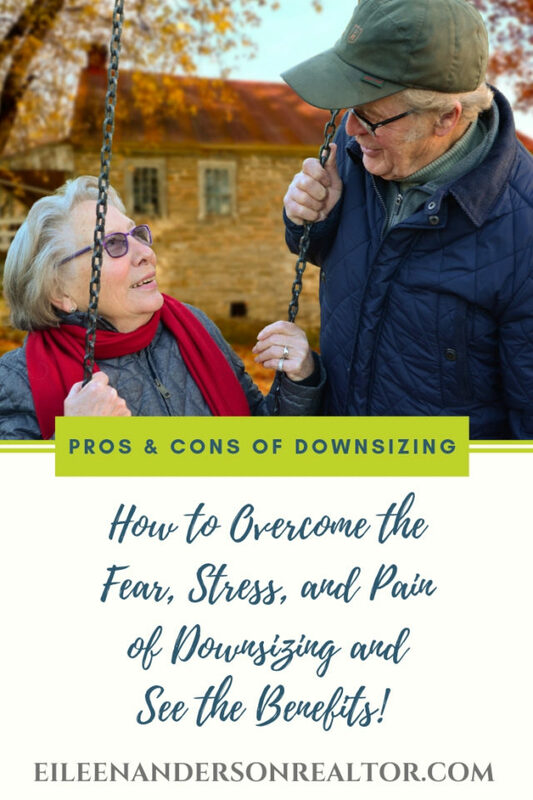 The pain and heartache of downsizing – how to overcome and move forward. Who Can Assist Me in My Downsizing Decision Making? 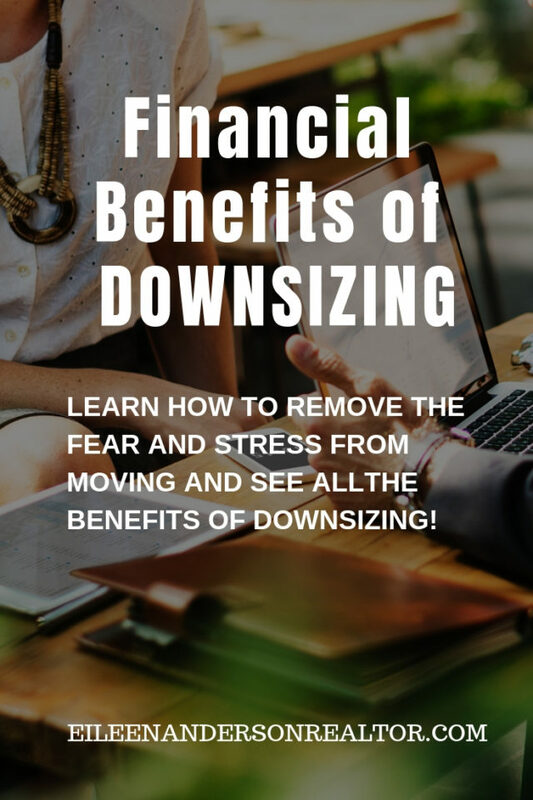 If you need help overcoming fear, stress and pain of downsizing start here. Get help from your REALTOR® to put together a team of experts that have knowledge of how to serve ages 50+ clients. This team should have a good understanding of how Medicaid, Medicare and Social Security will affect you. Today there are many resources to assist seniors with downsizing. Many Real estate professionals have special training on issues and concerns related to older home buyers and sellers. They also are especially sensitive to the fact that moving can be highly emotional for someone who has lived in a home for many years. There are professional “senior moving” consultants to help with the downsizing process and personal organization. Once you decide what to keep and what to let go of you can hire a professional moving company to pack, load and move your belongings to your new home. 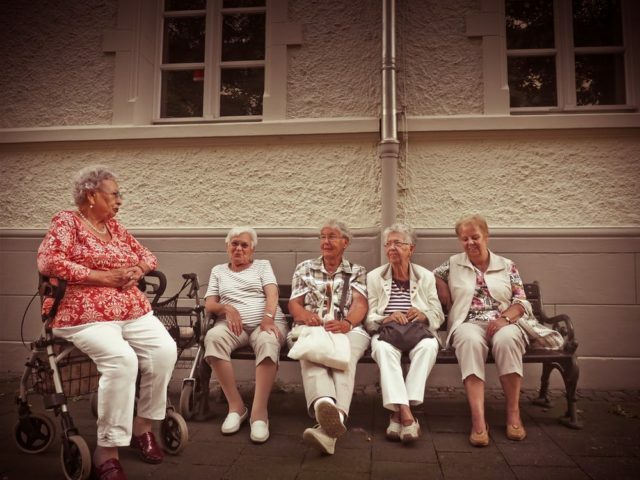 There are also moving coordinators at senior living communities to help you in your downsizing decisions including how to set up your new home. 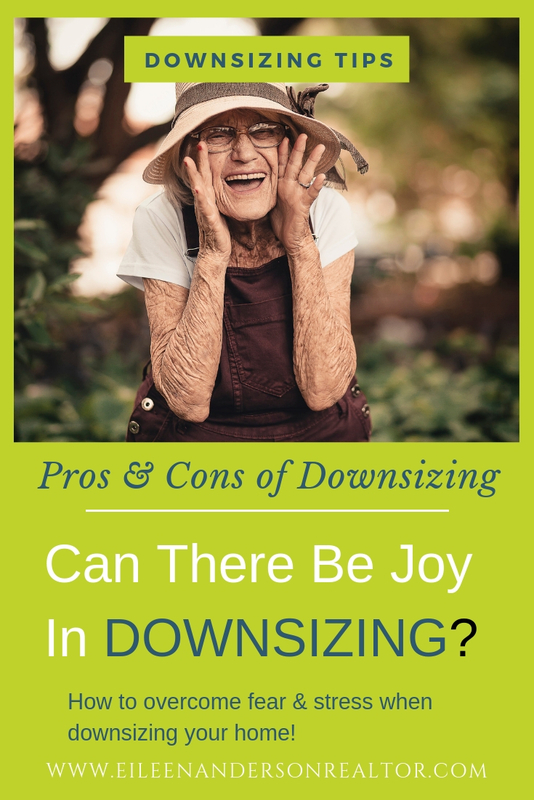 Will Downsizing Help or Hurt Me Financially? You might want to meet with a financial planner to discuss the pros and cons of moving and how it will affect your financial security. Real estate decisions can be impacted by 401K retirement accounts or IRA’s. Your financial planner can integrate the sale of your home into your estate planning. Make sure you understand how to manage your budget. Learn how pensions and reverse mortgages work so you will be able to make sound financial and real estate decisions. If you are contemplating getting a mortgage of any kind be aware that there may be loan scams that take advantage of borrowers over the age of 50. Work with someone you know and trust. If you don’t have a mortgage loan professional that you know ask your REALTOR® for referrals. Will I be Able to Find a Home to Fit My Lifestyle? Wherever you are contemplating moving to, make sure your transactions comply with federal laws, including the Housing for Older Persons Act (HOPA). This Act containes a provision exempting “senior” housing from the prohibition against familial status discrimination. The HOPA modified the statutory definition of housing for older persons as “housing intended and operated for occupancy by at least one person 55 years of age or older”. You can apply for affordable apartments for low-income families, the elderly and persons with disabilities. The Housing Choice Voucher Program (Section 8), can help you find your own place and you can use the voucher to pay for all or part of the rent. To apply, contact a public housing agency in your state. Downsizing could bring great benefits to you and your finances. But to cash in on those benefits, you’ll first have to overcome your emotions. Moving to a new home may seem like a natural or easy transition for seniors when in truth it can cause trauma, disorientation, stress and anxiety. Family members need to understand that it may not be an easy transition for their loved ones. Things can get complicated to the point that their loved one may not want to move. Families should support their loved one and keep them involved in the process of making the decision to move. Seniors can feel like they are not being heard and have lost all control in the decision-making process of finding a new home. Take them on tours of the new communities they are considering and listen to their feedback. This will aid them in feeling respect and being heard. If a family member is moving into a new community, spend some extra time with them. Encourage them to participate in activities to make some new friendships. All the emotions and pain of moving are real feelings to seniors. Let them know that these feelings are normal and in time they will pass. 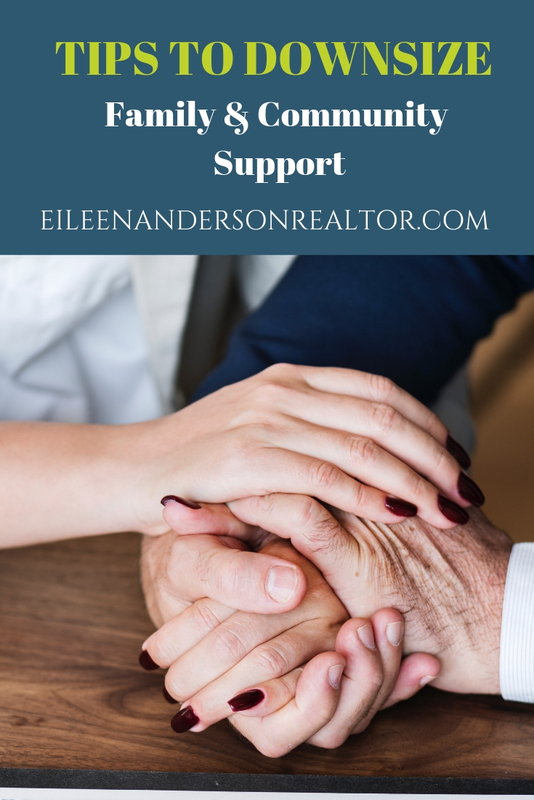 Family members that support and understand their loved one will help tremendously in this transition. When a loved one expresses their feelings of sadness in leaving a home they raised a family in for years, empathize with them and let them express their feelings. Telling them to be happy and that the new home will be great simply dismisses their feelings. I know you want to cheer them up but all they hear is that you don’t want to hear their feelings. How you respond will make all the difference in the world. What Will I do with a Lifetime of Belongings? How do I choose which things to keep and what to get rid of when I downsize? Letting go of a lifetime of possessions can be very difficult when sentiment is involved. Many people fear they will forget the memories associated with an item. I found that taking pictures of things makes it easier to let go. We all store mom’s homemade afghans fearing we can’t let go of them but Mom would want them to be shared. There are so many homeless shelters, battered women shelters, and vets that need household items. Think of how pleased your loved one would be knowing that you shared with someone in need. Let it go. You should have measurements of your new home to help you decide what to do with your large pieces of furniture. Will they fit, will they look nice? Maybe decide to take a couple of your favorite pieces and donate the rest. There are charities that will pick up the large pieces for you. It is nice to start fresh with a few new pieces. If you love your couch or dinning room chairs but they are beat, send them out to get reupholstered to bring new life to them. If you feel like this is overwhelming recruit family members to help you decide what will bring you joy to keep and joy to share. Staring the process early will make it easier. If you don’t do it, someone will have to sort through all your possessions and decide for you. This is by far harder and more emotional for all. Remember even though you raised children, celebrated all sorts of milestones, and have a lifetime of memories in this home you can let the house and belongings go because the memories will always be with you. What is the Best Way to De-Clutter? Here are some pointers on getting ready to move. 1. Give yourself ample time to pack your house and remove items you don’t want. 3. De-clutter now! Don’t wait till the last minute. 5. Don’t procrastinate. Get it done. 6. Don’t stockpile too many documents, old magazines and books. 7. Don’t try to sell used furniture unless you know it is an antique. Used furniture is not worth as much as you think. 8. Tag sales are exhausting and are rarely worth it. 9. Selling on the internet can be dangerous. Do you really want to invite strangers into your home. 10. If you have not used it or worn it for a year, get rid of it. 11. Deciding what to keep and throw away -Let it go! Take a picture of it and Let it go. 12. Does it give you joy? No….it’s gone. A wonderful new environment to meet new people who are in the same stage of life and share your interests. • SAFETY – Your new home can be adapted for safety, comfort, and aging in place. Your family can relax and know you are in a safe environment. • Your will find your memories came with you but now your surroundings are free of clutter and your life is more organized. • New Activities and new friends. Places to go, people to see, and fun to be had. • Tax donation for charitable donations to wonderful organizations to help battered women or vets. Such a great feeling! • A wonderful new environment to meet new people who are in the same stage of life and share your interests. • Less yard and house maintenance. Many communities have lovely gardens and a place to relax in nature. • Fewer property taxes, reduction in mortgage payments, and less home maintenance expenses. • If you are moving and suffering the loss of a person you have spent years with, dealing with this grief can be isolating and painful. Having onsite healthcare and counseling professionals can be very supportive during this time as well as new friends. • Try to focus more on what you are gaining. You’ll have less to worry about in a smaller space, your life will be simpler, and you’ll be enhancing your quality of life. Think about all the things you will have to look forward to. Moving is never a simple task. Coordinating all the things to do and the logistics can be daunting. Ultimately, the benefits of living in a smaller home or in a community that suits your needs may be well worth the move both for health reasons and the built-in social support network. If you are considering a move to a smaller home there are many things to consider before jumping in and buying the wrong property. Whether you are empty-nesters or just want less house and more freedom, be sure you do your research before you jump into purchasing the wrong home in the wrong town. Consider your lifestyle and activities you like to do. Maybe you like solitude or maybe an active tight knit community. Is it possible to find both. Take inventory and do your research. Hiring the right real estate agent will be of utmost importance to your success. Make sure you interview several agents and that they clearly understand your needs and wants. They should be very knowledgeable about the communities that you are considering moving to. 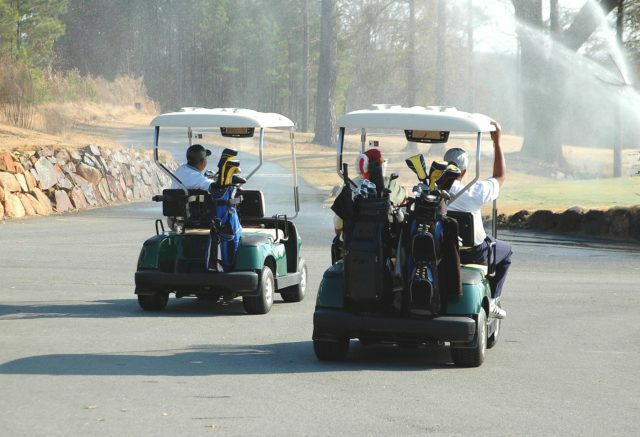 They should provide you with the things to do in the town and surrounding areas to make sure it fits your lifestyle. Perhaps you have grandchildren and want to make sure that you have plenty of things to do with kids that are nearby when they come to visit. You want a full time agent who knows the market well and has sales, marketing and recruiting skills, especially social media marketing. Be prepared with a list of questions to ask during the interview process. Your realtor should be able to discuss the pros and cons of buying a duplex, a single family home or a condo. If you have not purchased real estate in years don’t be afraid to ask a multitude of questions about the home buying process. The real estate market is constantly changing. Real estate, photography and garden information was provided by Eileen Anderson, recognized leader in her field. If you are looking to hire a top realtor or Real Estate Photographer, Eileen can be reached via email at Eileen@eileenandersonrealtor.com or by phone at 860-966-2112. Sign up for her real estate blog and receive monthly articles to help buyers and sellers through the real estate transaction process and home mortgage information. 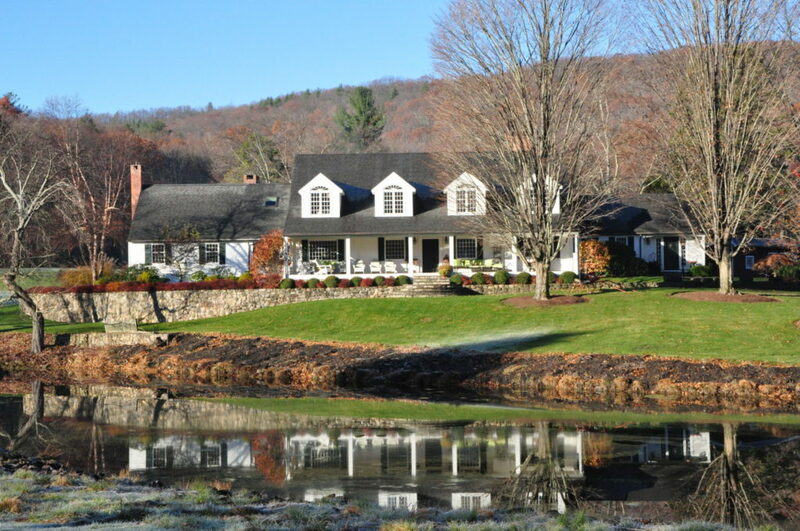 Eileen is a master gardener and also provides garden ideas (shade gardens that inspire), monthy gardening to do lists, hardscape ideas including how to build a stone wall, landscape design ideas, and other information relating to staging a home to sell. Eileen is licensed for residential real estate sales in the state of Connecticut including but not limited to the following CT towns: Avon, Bloomfield, Burlington, Barkhamsted, Canton, Colebrook, Granby, East Granby, Hartland, Hartford, Suffield, Windsor, New Hartford, North Granby, Farmington, Newington, Litchfield, Goshen, Simsbury, Suffield, Enfield, East Granby, Collinsville, and West Hartford, CT.